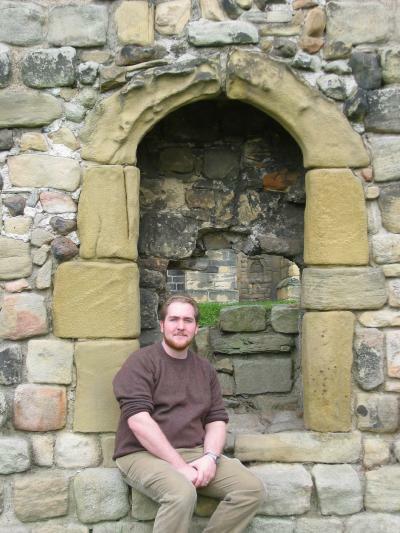 September 26-27, 2003 we took a trip up north to Durham (to see Durham Cathedral…where Bede’s bones are now) and Jarrow (the site of Bede’s monastery and of the Bede’s World museum). 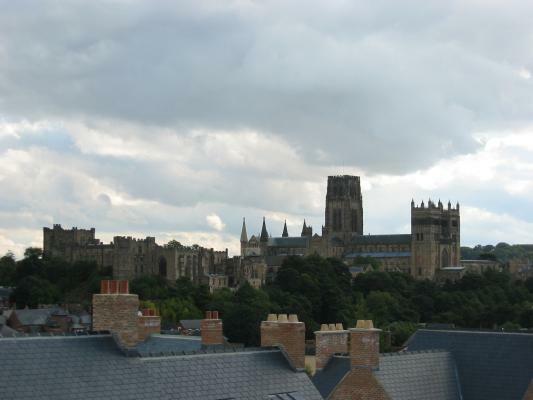 This is the Castle Hill of Durham…the castle (now the University College ) is on the left and the Cathedral on the right. This was our first view of the city from the rail station above the city. 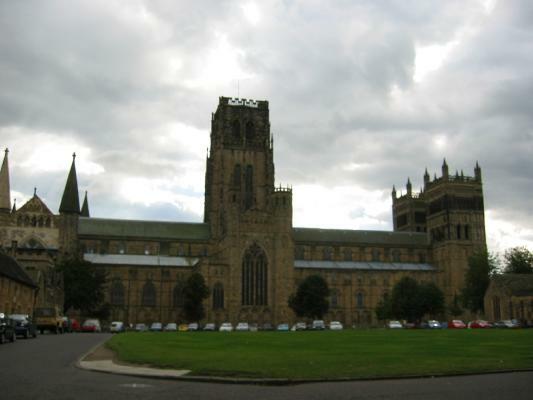 This is the Cathedral of Durham. 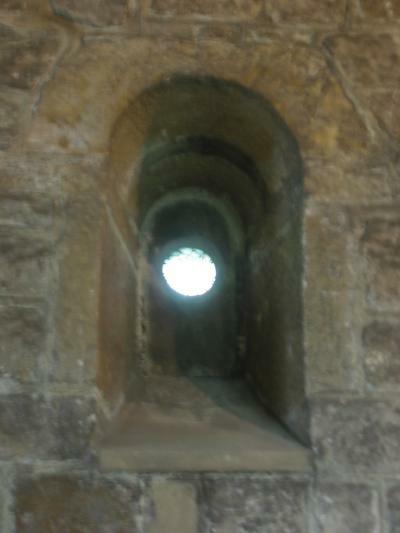 The two towers on the right are part of the Galilee porch, where Bede now rests. 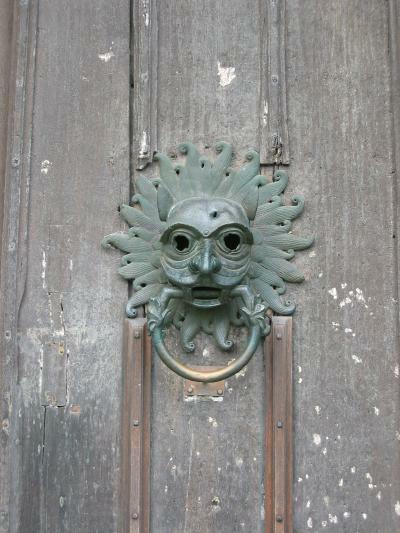 The picture on the right is the (replica) doorknocker that fugitives could use to claim sanctuary in the middle ages. Here we decided to take a rest outside the cathedral before we went to find our accommodations. We did try to take shots of the Cathedral at night, but sadly most of them did not come out well. Also, we weren’t allowed to take pictures inside, so we just had to buy postcards instead, which doesn't help this website much. 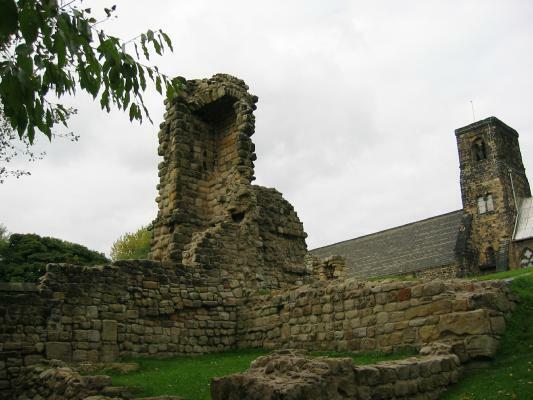 At Jarrow, we visited the remains of the monastery and the church of St. Paul , where Bede spent most of his life. Here Paul the scholar poses for a picture. 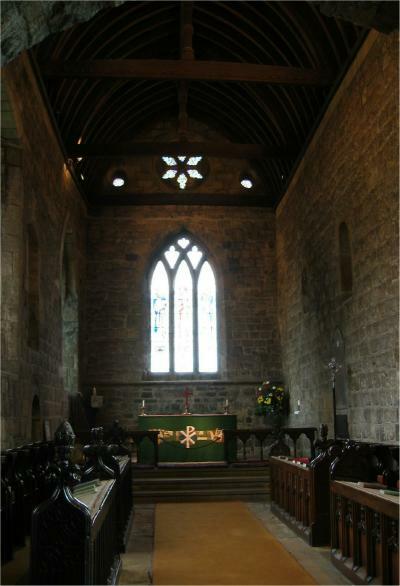 St. Paul ’s is the (Anglican, now) parish church of Jarrow . 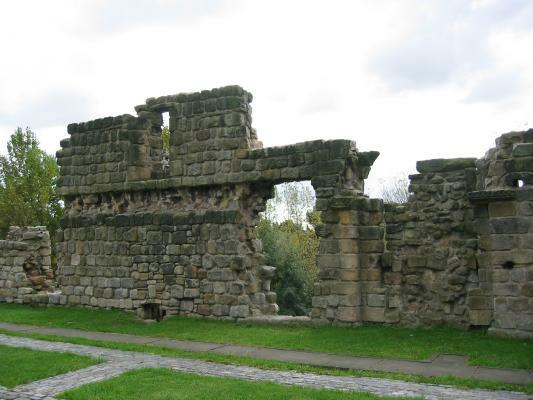 It has expanded, but this area is the original church from the monastery founded in the 7th century, where Bede would have worshiped. 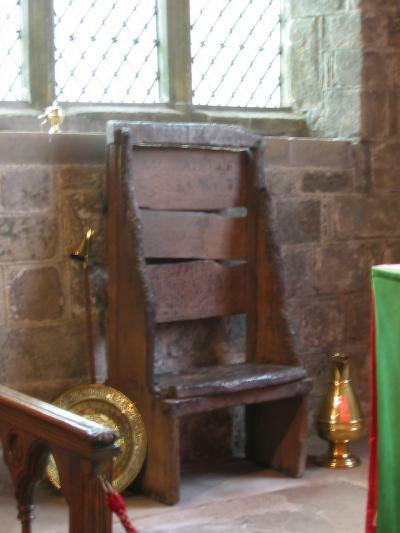 This chair on the right is reputed to have been Bede’s own chair. 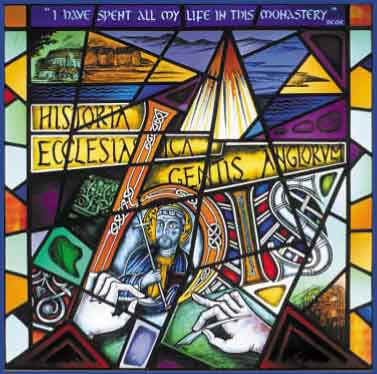 This window (two right pictures) is original to the church and was made in one of the monastery’s workshops. The window is located in the right-hand wall of the church. 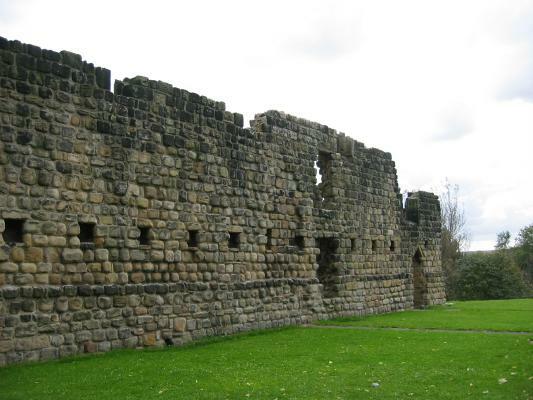 After we went to St. Paul’s, we visited Bede’s World, a museum dedicated to Bede and his times. 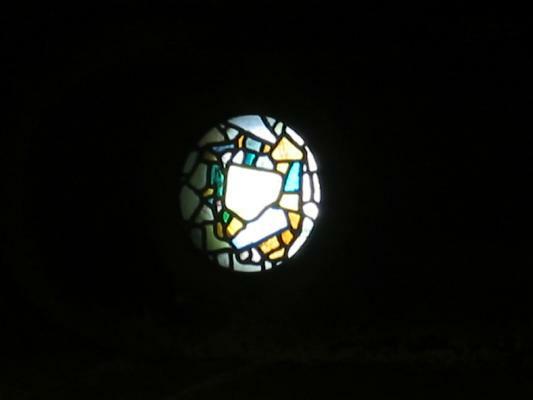 You may want to visit their website: http://www.bedesworld.co.uk. 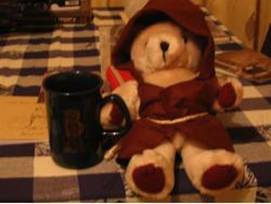 Well, we didn't get to buy monk's cowls at Bede's World, but we did get try them on (it's an interactive museum). In addition to the museum itself, Bede’s World has a reconstruction Saxon farm, made with period tools and stocked with animals that are as close to the breeds that would have been on Saxon farms as possible…including large, mean, sharp-toothed pigs! Really, the sign warns that the pigs have very sharp teeth and will jump up and bite you if you get to close. After we left Bede’s World, we went by St. Paul’s church again before we left town. 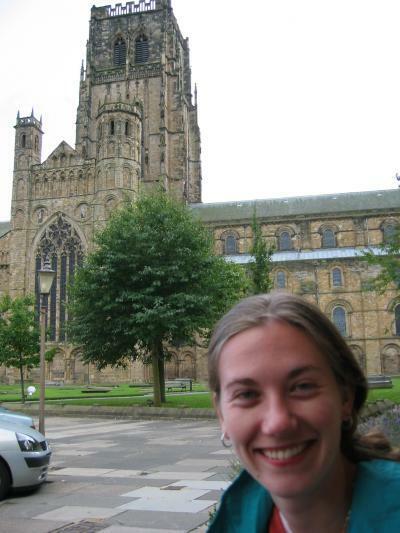 We had had to take a train from Durham to New Castle, then take the Metro to Jarrow, so we had to reverse our steps and then catch the train from Durham to Cambridge (switching in Peterborough)…trains are much less frequent this way on the weekend, so we had to make sure we caught that train. But we did get our cheesy souvenirs.